The conditions in Wanaka seemed to be pretty hard, the race adjustment of –4:36 is one of the slowest in the last years. The course rating has dropped by more than a full minute to 2:03 – just barely faster than IM Hawaii. Last year’s champion Jamie Whyte also had a strong race and finished second. After more than a year of not finishing Ironman-distance races and being in a crash with severe injuries close to this race, Kieran Doe grabbed the last podium spot in a time that was only a little bit slower than predicted. Britta Martin ran her way into second place. She and third-place Simone Maier were the only women who managed to finish faster than their expected times. 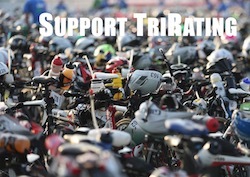 Triathlon Rating Report 2011 is ready for download!